“Jacob’s Well” (24” x 30”) oil painting by Marybeth Otway. 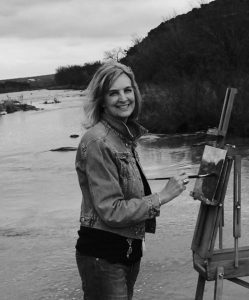 From billowing clouds over a sprawling Texas lanscape to the iconic imagery of Americana, artist Marybeth Otway artfully blends the beauty of the natural world with its modern inhabitants. Her use of delicate pastels occasionally punctuated by vibrant shades of rich color, allow her to capture the stillness of a moment in a way that few artists are able to achieve. As a member of the Creative Arts Center of Dallas, Otway’s extraordinary work has been displayed at the Mary Tomas Gallery, The Dutch Art Gallery and Lucas Street Antiques in Dallas, as well as in private collections around the country. One of her most mesmerizing paintings, titled “Jacob’s Well,” is featured in The Michael Aaron Gallagher Collection in New York. 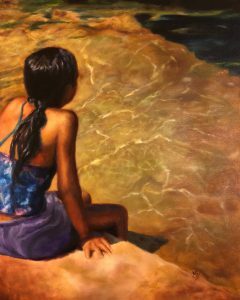 Based on the artist’s visit to a popular swimming hole in Wimberley, Texas, Otway’s stunning figurative work was inspired by a young girl watching swimmers dive from the cliff to the waters below. With its peaceful backdrop of shimmering light dancing across blue-green waters and delicate orange hues of the summer sun baking the rocky ledge, it is a powerfully reflective piece that illustrates Otway’s true gift for telling a story through her pictures. For more information about Marybeth Otway’s work, including how to purchase original oil paintings and prints by the artist, visit http://www.mbofineart.com.